One hundred years ago, the modern romance genre as we know it debuted its first imprint: Mills & Boon. Founded by Gerald Mills and Charles Boon as a general fiction publisher, ironically its first book was a romance, Arrows From The Dark by Sophie Cole. Between this period and the 1930s, Mills & Boon carved out a steady niche for new authors to enter the market, but it was during the height of the Depression that the imprint became entwined with the romance novel. Considered be the “Golden Age” of M&B, the 1930s saw six to eight thousand copies of each story printed, and with an emphasis on packaging, the brightly colored covers became a trademark for the brand allowing easy recognition that caused titles to fairly fly off the shelves. On the back of every new M&B title, an advertisement declared: “I always look for a Mills & Boon when I want a pleasant book. Your troubles are at an end when you chose a Mills & Boon novel. No more doubts! No more disappointments!” In the post-WWII climate, M&B shifted gears with the times once more by instituting a direct mail catalog and promoting its titles across Europe. M&B caught the attention of American-based Harlequin in the 1950s and the M&B authors were exposed to the North American market with such popularity that many authors were surprised by the ample royalty checks arriving in the mail! By 1966, paperbacks represented 50% of Mills & Boon’s stock and by 1968 they were releasing 130 hardback and 72 paperback romances a year. The ties between Harlequin and M&B were cemented by success, and gradually, titles that didn’t fit the tried-and-true Nurse-Doctor romances. In the spirit of progress, the sexual content in each book increased as well. The companies merged in 1971, and a controlling interest was sold to Torstar a few years later. With a large corporation backing them, Harlequin-Mills & Boon were able to publish their novels across the globe, and by the mid 1980s the imprint had sold nearly 250 million books worldwide. To celebrate Mills & Boon’s centenary, not only has the imprint planned a bunch of events, they also plan to release books written specifically for the 100 year celebration. 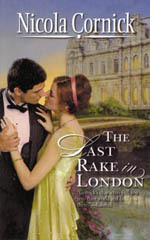 The most exciting entry in the list is Nicola Cornick’s June release (May for you British readers) The Last Rake in London. Set in 1908, the year of Mills and Boon’s founding, it is the story of one of the last dukes of Kestrel and the scandalous owner of a nightclub. Under a blaze of chandeliers, in London’s most fashionable club, Jack Kestrel is waiting. He hasn’t come to enjoy the rich at play, he’s there to uphold his family name. But first he has to get past the ice-cool owner: the beautiful Sally Bowes. And Jack wants her to warm his bed – at any price! Edwardian society flocks to Sally’s club, but dangerous Jack Kestrel is the most sinfully sensual rogue she’s ever met. Inexperienced with men, the wicked glint in Jack’s eyes promises he’ll take care of satisfying her every need..
Join me later this month for a special interview with Nicola! To whet your appetite, check out her excerpt. One of my Google Alerts sent me to this post and I’m so glad it did! As a long-time M&B reader (and aspiring writer) I discovered snippets I didn’t know – thank you! I also loved the excerpt of Nicola’s May release and I’m thrilled, especially as it’s one of my recent purchases from the M&B website and will be on my TBR shelf soon. If you don’t mind, I’d love to add your Blog/website to my links? No problem Sue! Glad you enjoyed the post. Fascinating post! And I can’t wait to read Nicola’s book. It sounds really intriguing. I love a book with a Scandalous Woman as the heroine.